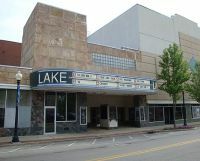 Theater opened in 1938 as the Lake Theatre. It closed in 1980 and didn�t open again until 1994. It closed January 15, 2013 as the Lake Cinema 8. It opened in April 2013 as the Lake 8 Movies. This movie theater is near Norton, New Franklin, Barberton, Coventry Township, Akron, Doylestown, Clinton, Wadsworth, Copley, Fairlawn, Rittman.